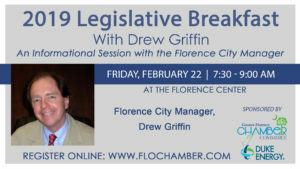 The Florence Chamber is happy to announce the speaker for this year’s Winter Legislative Breakfast. 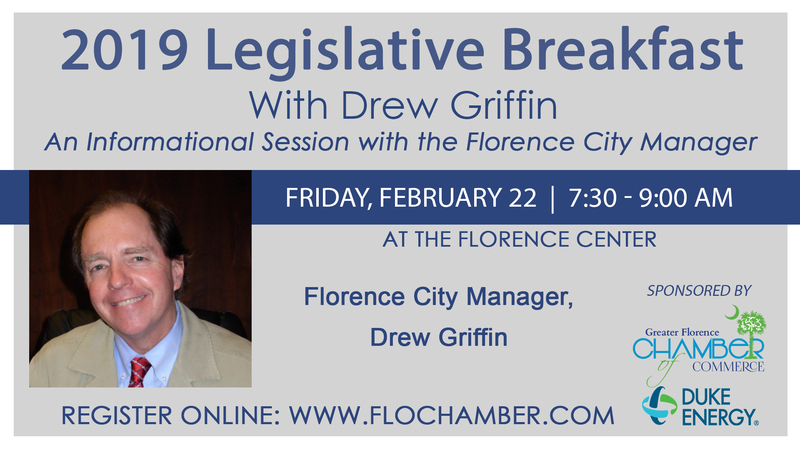 Florence City Manager, Drew Griffin will address the crowd on many topics of interest ranging from roads, key projects to city water and sewer. If you have ever wondered about how certain things are done within the city of Florence, now is your chance to find out. A Q&A session will be held after Drew’s presentation. The Breakfast will be held at Florence Center on February 22, 2019. Doors will open at 7:30am for breakfast and the program will begin at 7:45am. This event is sponsored by Duke Energy.